Stella's Musings: Muscular Dystrophy? So What? Every day, I get a number of email alerts on upcoming events. Today, one of them caught my eyes: a run in a British town to raise fund for victims of Mascular Dystrophy. It also inspired me to re-tell the story of Sanjana Goyal - a victim of Mascular Distrophy and now India's most vocal campaigner against the disease. 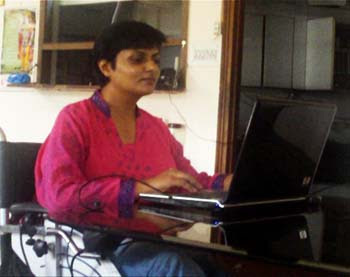 Sanjana Goel from Solan city of India’s Himachal Pradesh state has Muscular dystrophy (MD) - a genetic disorder that has left her paralyzed below waist. But despite her physical handicap, Sanjana has become a successful entrepreneur who owns a design boutique. She has also established the first Muscular Dystrophy counseling center in her state where she provides support and livelihood training to youth suffering from MD. Her work has won her several recognitions, including the Yuva award, given by CNN-IBN news channel, to young people with exemplary achievements in life. Muscular dystrophy is a hereditary disorder which slowly causes muscle fibers to weaken and break down. The symptoms are general weakness of muscles on hands, and face. Later it causes stammering, slowness and gradual numbness of body organs. There is no cure for MD, but drug treatment for symptoms, therapy, and assistive technology can make a huge difference for a person with the condition. Sanjana developed MD in her teenage and was quick to realize what was happening to her because two of her brothers had the same disorder. So, instead of feeling frustrated or hopeless, she researched a lot about the disease and became confirmed that though MD causes paralysis, it is not a fatal disease. This knowledge gave Sanjana courage to live a good life, despite the physical difficulties caused by her disease. So, a determined Sanjana went to university, earned a masters degree and started her own business of fashion designing. Once she gained financial independence, Sanjana started following her mission: Empower those who have MD, to overcome their physical challenge. According to Muscular Dystrophy India – an organization that researches, monitors and provides information on Muscular dystrophy, about a quarter million people in India today suffer from the disease. For all these people, Sanjana is a true inspiration. 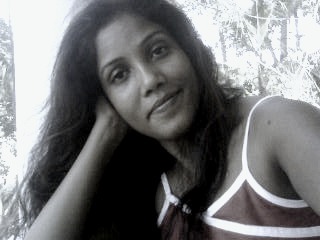 Especially for those women who suffer from MD, Sanjana provides training in vocations that can help them earn a living. So young women MD patients can learn how to be a beautician or a hairstylist or a designer and become an entrepreneur. What sets Sanjana apart from thousands of others? I feel it’s the fact that instead of providing ad hoc solutions, she is trying to help physically challenged women become financially independent, so they can overcome self-pity and stigma that they face within the community. To me, that’s the sign of a leader and a woman who can inspire a million! Kudos to every one involved in this wonderful effort.